From the outside looking in, Harvard may seem like a gladiator arena where students duke it out with one another for academic glory. But it really isn’t. In fact, it’s nowhere near that serious. I can’t deny that Harvard students are motivated to succeed, nor can I disagree that there are those who believe that success comes only with outdoing your fellow classmates; however, not everyone thinks in this way. Most who assimilate into the culture of cut-throat competitiveness do so because they choose to. Getting sucked into this lifestyle is avoidable and most Harvard students soon realize that. They also realize that getting that coveted Bachelor’s degree is not hard. The hardest part about going to Harvard is actually getting in. 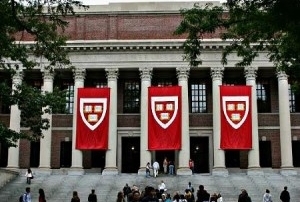 This year, Harvard accepted 5.3% of the prospective undergraduates who applied. What this relatively small group of students may not know is that once they are in, they won’t have to work as hard to stay in. In fact, Harvard will do whatever it takes to make sure that they all graduate. How do they do this? In addition to providing academic support in the form of tutoring services and office hours when students can meet one-on-one with professors and teaching assistants, Harvard maintains a high graduation rate using a flexible academic system that accommodates all of its students, no matter how strong they are academically. Due to a wide range of course offerings spanning varying difficulties, Harvard’s undergraduate program is so flexible that you can make it through your four years and do well without over-stressing. The trick is to make good use of the Harvard CUE Guide, which tells you everything you need to know about a class (workload, level of difficulty, how good the professor and teaching assistants are, etc. ), and to sample the classes you are considering during “shopping week” before committing to them. All of this makes planning your college life much easier, and if you play your cards right, you can fulfill your academic requirements early explore other subject areas for the rest of your college career. So whether you are a person who solely wants to challenge yourself intellectually, or are someone who cares more about your extracurricular involvement, the system caters to your needs and gives you the academic platform that is right for you. This is what it is really like to be a Harvard student. Melusi Dlamini is an Educational Consultant at Hale Education Group and a graduate of Harvard University.